Software design management for embedded systems has an intrinsic interdependency with the design and management of electronics hardware and mechanical parts. 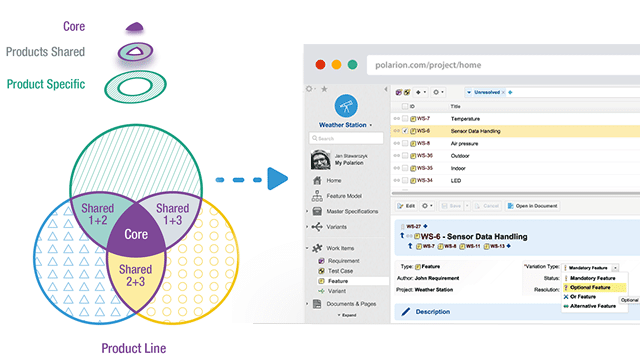 Teamcenter-Polarion interoperability provides the ability to manage, link and trace software requirements and design objects (code, functions, test cases, models, etc.) to data from other domains, enabling you to better understand all the cross-domain relationships and dependencies in all phases of the product lifecycle. From requirements to delivery and maintenance, software design management supports the software lifecycle in the context of the entire product to accelerate product introduction, and ensure that software and hardware work together right from the start. Software design management inside PLM can reduce costs and improve product quality. Read more about these features below. ALM-PLM interoperability fosters cross-domain collaboration by seamlessly integrating application lifecycle management (ALM) for software development with the product lifecycle management (PLM) environment you use to manage other areas of the product. 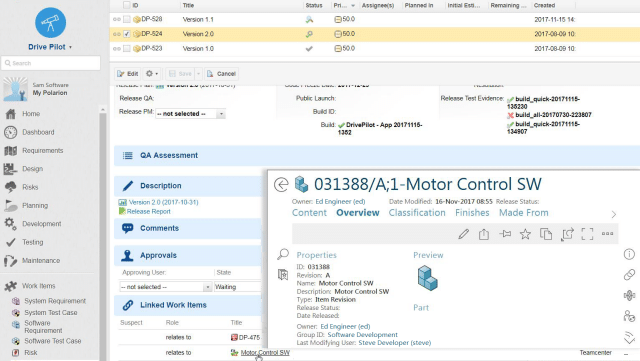 The ALM-PLM interoperability of Teamcenter and Polarion ALM effectively merges the advanced software application development capabilities of Polarion with the robust product lifecycle management capabilities of the Teamcenter portfolio of applications. 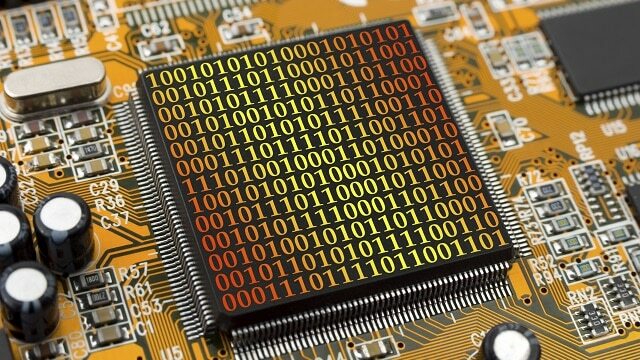 Binary management for embedded software improves design productivity and overall product quality. 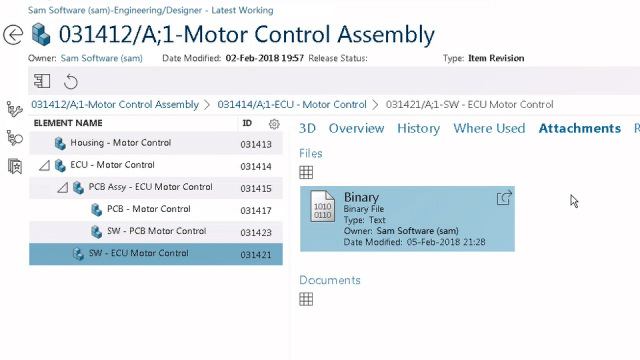 Teamcenter can manage your released binary software as a “part” in the same single source of product and process knowledge used to manage the rest of your electronic, electrical and mechanical design information. With binary management you can create and manage software-to-software, software-to-electronic control unit (ECU) and ECU-to-ECU dependencies, enabling you to more effectively reuse software modules across the entire product line. Most product functions are controlled using software calibration and configuration parameters that enable you or your customers to configure the product so that it will operate exactly how you want it to. Siemens PLM software provides a single source of calibration and configuration parameters management that you can use to define, manage and update parameters associated with a product and all of its variants across an entire product line.